Thinking beyond the pilot line for the PFEP (Plan for Every Part) when designing the parameters of the database is essential. Some other value streams may require data that are not reflected in the pilot line. Even if there are blank areas in the data, it is better to begin with a comprehensive database as possible. Just as in one-piece flow, the goal is to use the smallest possible measure for each item. Use the smallest increments of measure, such as pounds versus tons, and inches instead of feet. Assign a PFEP Manager for each value stream, from the Production Control department. This is the only person who can update or change items in the PFEP. Keep the control for changes in as few hands as possible to avoid errors. The next step in the Lean logistics conversion is to create a purchased parts supermarket. Once all materials and information for the smooth flow of the target area have been gathered, supermarket can be created. With a proper Lean assessment, manufacturers must remember to leave space around the value-added production cells for supermarkets. The closer the supermarket can be to the point-of-use, the less motion and transportation waste there will be, and the more closely linked the Lean logistics system will be. The aim is to have a system that behaves like the autonomous nervous system, able to react to signals (pull) quickly. In many cases materials are moved off of the truck, placed in temporary storage, paperwork processed or inspected, then moved before it reaches the final destination (point-of-use). This is waste that the Lean logistics conversion aims to eliminate. As much as possible, design material and information flow so that it goes from truck to supermarket without stopping. As the material travels from the supplier to the point-of-use, count how many times it is put down or picked up. The ultimate aim of Lean logistics is to touch the parts as few times as possible; the net savings is a reduction in total cost to both manufacturers and suppliers by eliminating any interim storage locations, depots, and staging areas. The sizing of the supermarket is based on the maximum inventory levels of each part. Determine the maximum usage for each part to support normal operations. Base the sizing of the supermarket on the maximum usage for each part to support normal operations. In practical terms, this means determining the average usage of each part at the target site (cell, line, etc.). This information allows manufacturers to determine the maximum inventory required for each part. 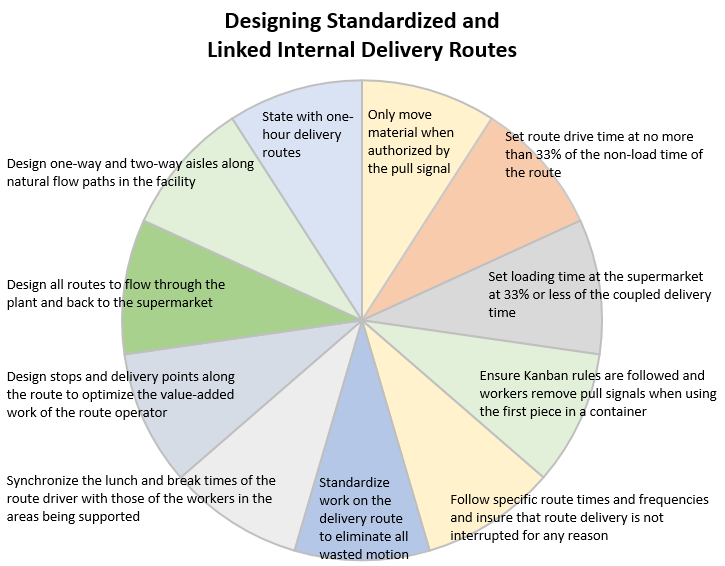 Use a supplier rating system, a carrier rating system, and history of internal demand variation to set a safety buffer. Important factors to consider are the number days’ supply of inventory required to buffer for weather-related delays, sudden production swings, and line stops due to supplier quality or delivery problems. Chris Mosby, LSSMBB is the Lean Manager for Topper Industrial. Mosby has been a Lean/Six Sigma trainer for more than 20 years in multi-faceted, fast paced manufacturing environments. His experience includes management assignments in Quality, Production, Logistics, Healthcare, and Maintenance/Engineering.